As any good Italian knows, gravy is red sauce. Not just any red sauce, though, (and heaven help you if you’re even considering something out of a jar,) but the good stuff: fresh, thick, and slow simmered for almost an entire day. 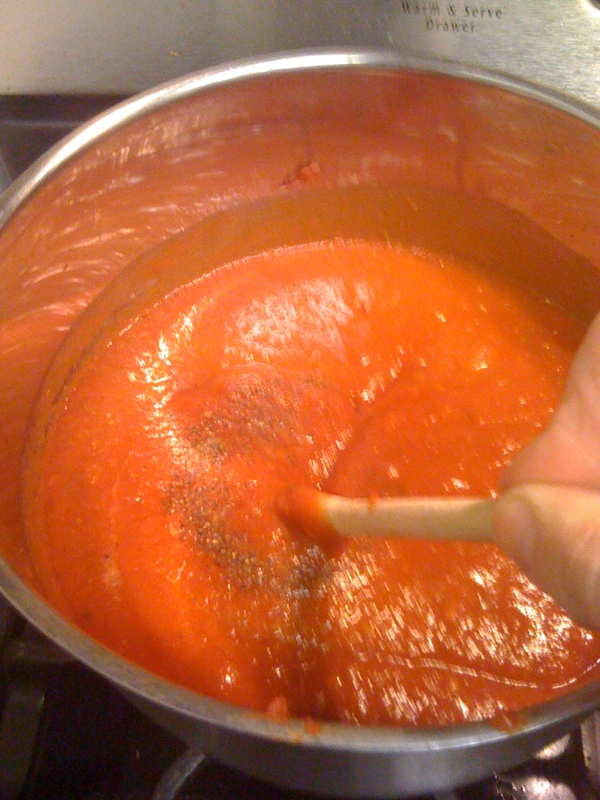 However, as most of us don’t have an entire day to babysit the gravy, I’ve adapted my Grandma’s techniques into this easy marinara recipe that you can make on any given weeknight with minimal prep time and effort. Mince your mushroom extra fine. To start, dice up half a vidalia onion and saute it a large sauce pan with extra virgin olive oil. (I like to use at least a 4 qt. pan; this stuff bubbles a lot.) Use enough oil to cover the bottom of the pan. 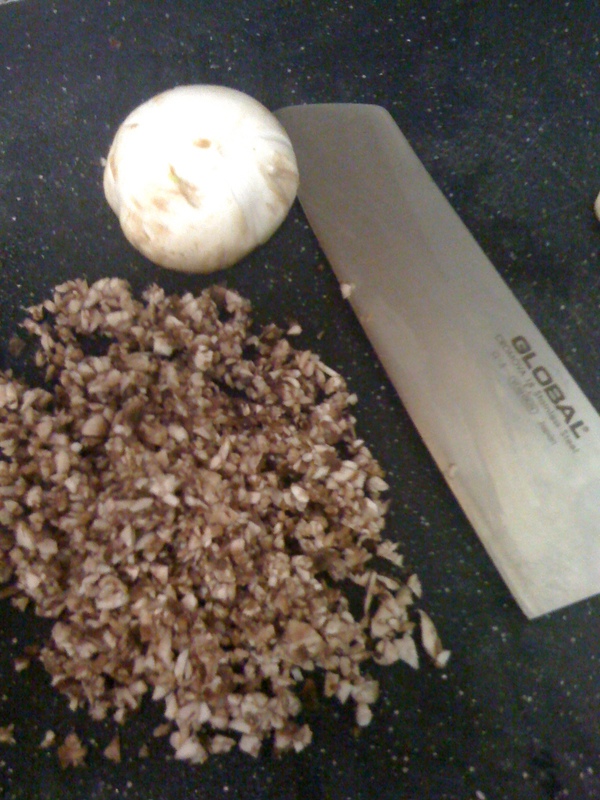 Mince (the finer the better – you want these to almost melt into the sauce,) 3 cloves of garlic and one large white mushroom; add them to your onions. 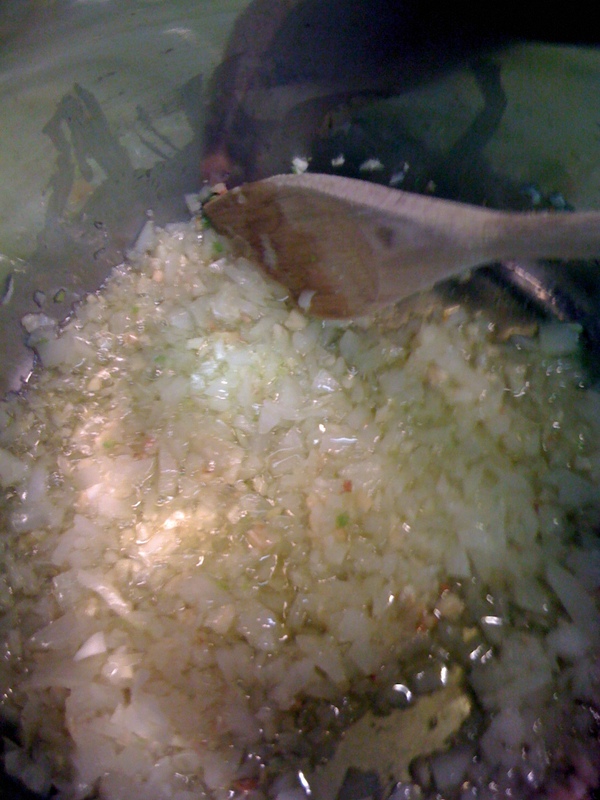 Cook the mixture on medium low heat until the onions are clear (don’t brown them.) Add more olive oil if necessary as you go – you always want the onions to have enough. Next, add two 6 oz. cans of tomato paste. Stir until the mixture is blended well. Add two 28 ounce cans of crushed tomatoes. (I liked Muir Glen Organic because they offer both a Fire Roasted and a plain tomato and basil variety. I like to use a can of each to add a little bit more depth to my sauce, especially when I’m not cooking it all weekend.) Add salt, pepper, and oregano to taste. Stir and simmer for about 5 – 7 minutes. Once the sauce has just begun thickening up a tad, take one of your empty cans of crushed tomatoes; fill it half way with water, and the other half with whatever sort of tasty red wine you have lying around the kitchen. (I happened to have a Concannon Petite Syrah open – it was delicious and worked really well with the flavors of the fire roasted tomatoes. Whatever works though, as long as you follow one rule of thumb: if you wouldn’t drink it alone, don’t cook with it.) Stir and cover, letting your sauce simmer on a medium heat. Now comes the easy part: walk away. You can happily leave your sauce to its own devices for the next half hour. 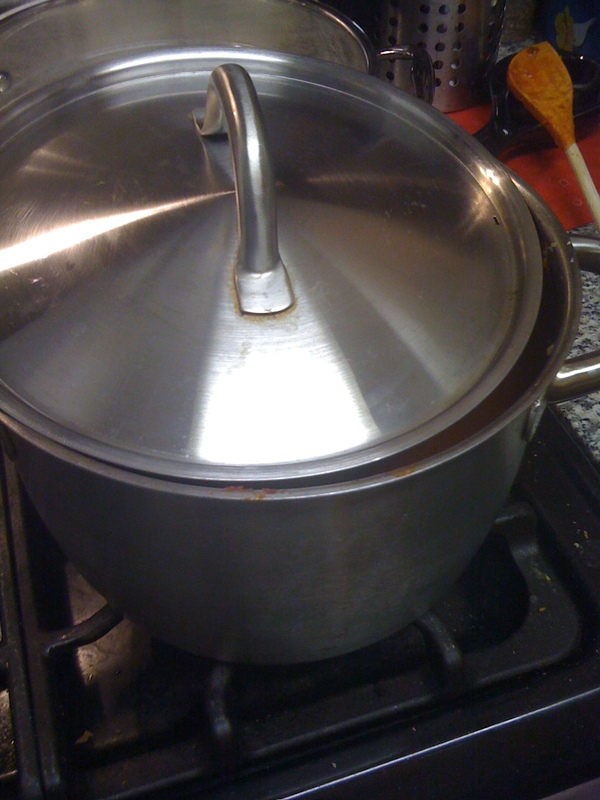 After 30 minutes, slide the lid to the side to allow some of the extra water trapped in the sauce to steam off. I recommend leaving it to simmer semi-covered for an additional 15 minutes, although it only gets better the longer you leave it on the stove. After about an hour of simmering time, you’ll have a perfectly thickened, multi dimensional marinara sauce that tastes just like Grandma used to make. While the sauce is great on fresh pasta or with meatballs, it also works well as a pizza sauce, over chicken/eggplant/veal parmesan, in lasagna, or where ever else you would use a tomato sauce. I especially love to make large batches of this sauce as a time saving measure on weekends. If you pour the sauce into a jar and seal it when the sauce is still fresh off the stove hot, the jar will effectively vacuum itself closed and stay fresh. It also holds up well to freezing, in the event that you don’t have spare jars lying around the house. Chef’s note: I tend to judge the quality of a dish by how badly I burn myself during the course of making it, as my general lack of hand-eye coordination makes not burning myself virtually impossible. So, if my thumb is any indication, this is a RIDICULOUSLY good sauce, but please be careful of the bubbling and splashing potential when you stir or pour your sauce. It is HOT. 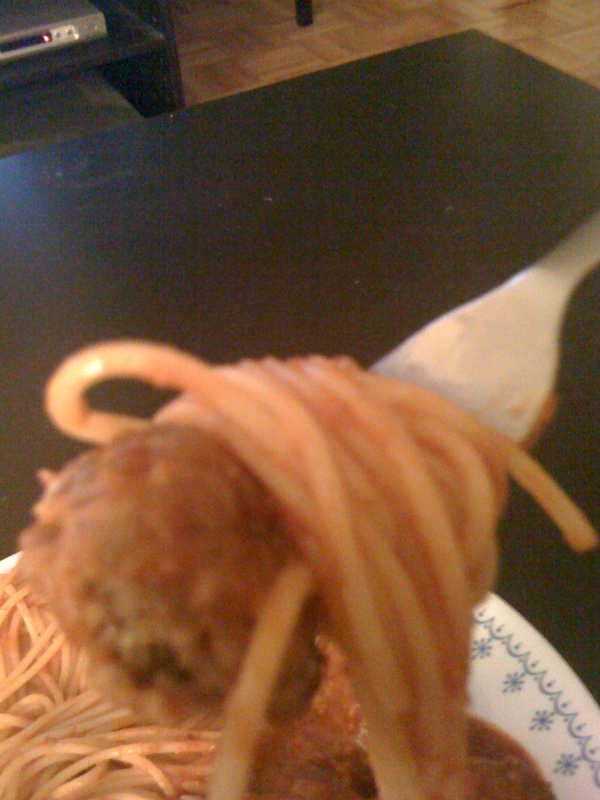 My final product: spaghetti and meatballs with fresh homemade sauce!